The Biomimetic systems for cell engineering group is a junior group under IBEC’s Tenure Track scheme. Cross-section of a cardiac tissue construct cultured in a perfusion bioreactor with electrical stimulation. A primary culture of neonatal rat cardiomyocytes was seeded in a 3D collagenelastin matrix. 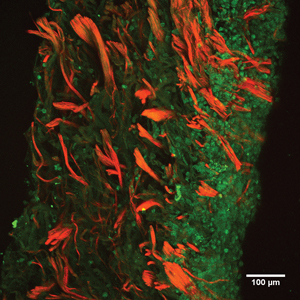 Collagen fibers (orange) were imaged using two-photon second harmonic generation (SHG), and elastin fibers (green) using autofluorescence. As cells have a high degree of autofluorescence they are also shown in green, densely packed in the right part of the image. In vitro assay platforms involving human cells are increasingly important to study tissue development, tissue regeneration, construct models of disease or develop systems for therapeutic screening that predict the human in vivo context. The main conceptual problem of the standard in vitro cell-based assays is that they rely on two dimensional monolayer cellular cultures, which fail to replicate the complexity of living systems. There is an urgent need to create technological platforms with complex cell culture systems that mimic better the tissue-like cellular microenvironment. We propose to combine engineering microfabrication technologies, tissue engineering concepts and recent advances in stem cell research, exploiting stem cell unique properties, to create cell culture microenvironments that will go beyond current 3D in vitro models. Resulting in vitro tissue equivalents aim at recapitulating in vivo cell functionality, cell renewal and migration, multicell-type differentiation and cell-matrix and cell-cell interactions. The cell culture platforms proposed will provide physiologically relevant and highly reproducible data, and they will be compatible with conventional cell culture assays and high-throughput testing. The new organotypic cell culture platforms will aim to advance the in vitro modelling of diseases, the preclinical screening for drug toxicity, the understanding of organ development and the regenerative medicine applications. Current main projects are: (i) to engineer and validate a complex in vitro model of small intestinal epithelium and (ii) to engineer and validate a novel in vitro model of engineered cardiac tissue. 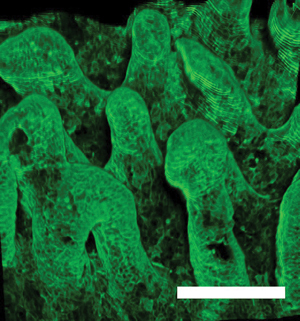 Hydrogel microstructures mimicking villi of the small intestinal tissue. They have been fabricated of PEGDA polymer and functionalized with labelled protein (in red). 3D rendering of villi-like microstructures fabricated of an hydrogel and seeded with Caco-2 cells. Scale bar = 200 µm. On Friday 19th October, an event to round off the Fundació Catalunya La Pedrera’s ‘Bojos per la ciència’ (‘Crazy for Science’) initiative took place at IBEC. Eight IBECers were in the Netherlands on 13th and 14th September for the first ever IBEC-ICMS Symposium, ‘NanoSens&Med’. Today IBEC welcomed the new Director General of Research, Development, and Innovation of the Spanish Ministry of Science, Innovation and Universities (MINECO) to meet some of the group leaders and hear about their research. IBEC’s Biomimetic Systems for Cell Engineering group has published a review about possible new strategies to study drug absorption in the intestine in the high-ranking journal Trends in Molecular Medicine. This week IBEC group leader Elena Martinez is in Toulouse for the EuroScience Open Forum (ESOF), the largest interdisciplinary science meeting in Europe, where she is taking part as a speaker. A ‘Results in Brief’ article about Elena Martinez’s ERC project COMIET has been published on the CORDIS website, the EC’s Community Research and Development Information Service. Today more than 300 researchers are meeting at CosmoCaixa to debate the latest scientific advances in cutting-edge fields at the yearly conference of the Barcelona Institute of Science and Technology (BIST). IBEC has signed a collaboration agreement with the Federación Española de Enfermedades Raras (FEDER), a non-profit organization that represents the three million people suffering from rare diseases throughout the country. IBEC group leaders Pere Roca-Cusachs and Elena Martinez featured in an article in Ara magazine at the weekend that discussed how understanding mechanical forces and their effect on cellular processes can open new avenues in the diagnosis and treatment of diseases such as cancer. Two projects coordinated by IBEC group leaders have been successful in gaining funding through the Barcelona Institute of Science and Technology’s IGNITE call, which promotes the initiation of new collaborations among BIST researchers and accelerate multidisciplinary research. IBEC group leader Elena Martínez gave the opening speech at Tuesday’s Premis Extraordinaris de Batxillerat 2016-2017 ceremony at the Palau de la Generalitat de Catalunya. This week IBEC is attending the second edition of “IN(3D)USTRY: From Needs to Solutions”, the international meeting devoted to 3D printing. Scientists from IBEC, in collaboration with the Hospital General Universitario Gregorio Marañón in Spain and two other groups in the USA, have made a big leap in heart regeneration advances by achieving heart grafts from human pluripotent stem cells for the first time in less than one month. The GLAM project, of which IBEC’s Biomimetics for Systems for Cell Engineering group leader Elena Martínez is a partner, is supporting the 3rd Festa StandupPaddle (SUP) in aid of leukemia research in Barcelona on 24th April. Elena Martinez, head of IBEC’s Biomimetic Systems for Cell Engineering group, has been awarded a prestigious European Research Council (ERC) Consolidator Grant to engineer models of the intestinal epithelium, an essential tool for understanding disease and tissue regeneration. Epithelial tissues are composed of layers of tightly connected cells shaped into complex three-dimensional (3D) structures such as cysts, tubules, or invaginations. These complex 3D structures are important for organ-specific functions and often create biochemical gradients that guide cell positioning and compartmentalization within the organ. One of the main functions of epithelia is to act as physical barriers that protect the underlying tissues from external insults. In vitro, epithelial barriers are usually mimicked by oversimplified models based on cell lines grown as monolayers on flat surfaces. While useful to answer certain questions, these models cannot fully capture the in vivo organ physiology and often yield poor predictions. In order to progress further in basic and translational research, disease modeling, drug discovery, and regenerative medicine, it is essential to advance the development of new in vitro predictive models of epithelial tissues that are capable of representing the in vivo-like structures and organ functionality more accurately. Here, we review current strategies for obtaining biomimetic systems in the form of advanced in vitro models that allow for more reliable and safer preclinical tests. The current state of the art and potential applications of self-organized cell-based systems, organ-on-a-chip devices that incorporate sensors and monitoring capabilities, as well as microfabrication techniques including bioprinting and photolithography, are discussed. These techniques could be combined to help provide highly predictive drug tests for patient-specific conditions in the near future. Mucosal administration of drugs and drug delivery systems has gained increasing interest. However, nanoparticles intended to protect and deliver drugs to epithelial surfaces require transport through the surface-lining mucus. Translation from bench to bedside is particularly challenging for mucosal administration since a variety of parameters will influence the specific barrier properties of the mucus including the luminal fluids, the microbiota, the mucus composition and clearance rate, and the condition of the underlying epithelia. Besides, after administration, nanoparticles interact with the mucosal components, forming a biomolecular corona that modulates their behavior and fate after mucosal administration. These interactions are greatly influenced by the nanoparticle properties, and therefore different designs and surface-engineering strategies have been proposed. Overall, it is essential to evaluate these biomolecule-nanoparticle interactions by complementary techniques using complex and relevant mucus barrier matrices. Here we present a nanostructured surface able to produce multivalent interactions between surface-bound ephrinB1 ligands and membrane EphB2 receptors. We created ephrinB1 nanopatterns of regular size (<30 nm in diameter) by using self-assembled diblock copolymers. Next, we used a statistically enhanced version of the Number and Brightness technique, which can discriminate - with molecular sensitivity - the oligomeric states of diffusive species to quantitatively track the EphB2 receptor oligomerization process in real time. The results indicate that a stimulation using randomly distributed surface-bound ligands was not sufficient to fully induce receptor aggregation. Conversely, when nanopatterned onto our substrates, the ligands effectively induced a strong receptor oligomerization. This presentation of ligands improved the clustering efficiency of conventional ligand delivery systems, as it required a 9-fold lower ligand surface coverage and included faster receptor clustering kinetics compared to traditional crosslinked ligands. In conclusion, nanostructured diblock copolymers constitute a novel strategy to induce multivalent ligand-receptor interactions leading to a stronger, faster, and more efficient receptor activation, thus providing a useful strategy to precisely tune and potentiate receptor responses. The efficiency of these materials at inducing cell responses can benefit applications such as the design of new bioactive materials and drug-delivery systems. Intestinal cell models have been widely studied and used to evaluate absorption and metabolism of drugs in the small intestine, constituting valuable tools as a first approach to evaluate the behavior of new drugs. However, such cell models might not be able to fully predict the absorption mechanisms and metabolic pathways of the tested compounds. In recent years, induced pluripotent stem cells (iPSCs) differentiated into enterocyte-like cells have been proposed as more biorelevant intestinal models. In this review, we describe mechanisms underlying the differentiation of iPSCs into enterocyte-like cells, appraise the usefulness of these cells in tridimensional intestinal models, and discuss their suitability to be used in the future for drug screening. Al2O3 microresonators were realized for sensing applications of both passive and active devices. Passive microring resonators exhibited quality factors up to 3.2×105 in air. A bulk refractive index sensitivity of 100 nm/RIU was demonstrated together with a limit of detection of 10-6 RIU. Functionalizing their surface allowed for the label-free detection of the biomarker rhS100A4 from urine with a limit of detection of 3 nM. Furthermore, single-mode Al2O3:Yb3+ microdisk lasers were realized that could operate in an aqueous environment. Upon varying the bulk refractive index their lasing wavelength could be tuned with a sensitivity of 20 nm/RIU and a LOD of 3×10-6 RIU. The Al2O3 waveguide technology was explored for sensing applications. Passive microring resonators with a quality factor in air of 3.2×105 were developed with a bulk refractive index sensitivity of ~100 nm/RIU and limit of detection of ~10-6 RIU. These were functionalized to detect the biomarker rhS100A4 from urine down to concentrations of 3 nM. Furthermore, Al2O3:Yb3+ microdisk lasers were realized that exhibited single mode lasing operation in water. Their lasing wavelength was tuned by varying the bulk refractive index and a bulk refractive index sensitivity of ~20 nm/RIU with a LOD of ~3×10-6 was achieved. Microring resonators find many applications for on-chip integrated optical sensors. Their spectral response contains resonance dips that shift due to variations of the optical path length of the microring probed. Numerous examples of such microring resonator sensors in the SOI, Si3N4 and SiON waveguide technologies have been reported for the detection of bulk refractive index variations and the label-free detection of biomarkers. Al2O3 is an alternative waveguide technology that exhibits low optical propagation losses, is transparent over a large spectral range extending from the visible to the mid-IR and permits co-doping with active rare-earth ions, which enables the co-integration of active devices on the chip. In this work an Al2O3 microring resonator sensor was developed for the label-free detection of protein biomarkers. The uncladded microring with a radius of 200 μm had a measured quality factor of 3.2 × 105 at 1550 nm. Submerging the devices in water decreased the quality factor to 45 × 103. This corresponds with propagation losses in the rings of 0.6 dB/cm and 5.7 dB/cm respectively. The bulk refractive index sensitivity of the sensor was determined by flowing NaCl dissolved in water in different concentrations. A sensitivity of 102.3 ± 0.5 nm/RIU with a corresponding limit of detection of 1.6 × 10-6 RIU was demonstrated for TM polarized light. High affinity human monoclonal antibodies mAb S100A4 were immobilized on the sensor to detect the S100A4 protein biomarker down to 12 nM concentrations. These results demonstrate the feasibility of this material for label-free optical biosensors. Eph receptor signaling plays key roles in vertebrate tissue boundary formation, axonal pathfinding, and stem cell regeneration by steering cells to positions defined by its ligand ephrin. Some of the key events in Eph-ephrin signaling are understood: ephrin binding triggers the clustering of the Eph receptor, fostering transphosphorylation and signal transduction into the cell. However, a quantitative and mechanistic understanding of how the signal is processed by the recipient cell into precise and proportional responses is largely lacking. Studying Eph activation kinetics requires spatiotemporal data on the number and distribution of receptor oligomers, which is beyond the quantitative power offered by prevalent imaging methods. Here we describe an enhanced fluorescence fluctuation imaging analysis, which employs statistical resampling to measure the Eph receptor aggregation distribution within each pixel of an image. By performing this analysis over time courses extending tens of minutes, the information-rich 4D space (x, y, oligomerization, time) results were coupled to straightforward biophysical models of protein aggregation. This analysis reveals that Eph clustering can be explained by the combined contribution of polymerization of receptors into clusters, followed by their condensation into far larger aggregates. The modeling reveals that these two competing oligomerization mechanisms play distinct roles: polymerization mediates the activation of the receptor by assembling monomers into 6- to 8-mer oligomers; condensation of the preassembled oligomers into large clusters containing hundreds of monomers dampens the signaling. We propose that the polymerization–condensation dynamics creates mechanistic explanation for how cells properly respond to variable ligand concentrations and gradients. Genome editing on human pluripotent stem cells (hPSCs) together with the development of protocols for organ decellularization opens the door to the generation of autologous bioartificial hearts. Here we sought to generate for the first time a fluorescent reporter human embryonic stem cell (hESC) line by means of Transcription activator-like effector nucleases (TALENs) to efficiently produce cardiomyocyte-like cells (CLCs) from hPSCs and repopulate decellularized human heart ventricles for heart engineering. In our hands, targeting myosin heavy chain locus (MYH6) with mCherry fluorescent reporter by TALEN technology in hESCs did not alter major pluripotent-related features, and allowed for the definition of a robust protocol for CLCs production also from human induced pluripotent stem cells (hiPSCs) in 14 days. hPSCs-derived CLCs (hPSCs-CLCs) were next used to recellularize acellular cardiac scaffolds. Electrophysiological responses encountered when hPSCs-CLCs were cultured on ventricular decellularized extracellular matrix (vdECM) correlated with significant increases in the levels of expression of different ion channels determinant for calcium homeostasis and heart contractile function. Overall, the approach described here allows for the rapid generation of human cardiac grafts from hPSCs, in a total of 24 days, providing a suitable platform for cardiac engineering and disease modeling in the human setting. Protein patterning is of interest in high-throughput screening. Due to an increase in demand for further miniaturization of protein assays, block copolymers (BCPs) that can undergo large-area phase separation into nanometer-size domains have attracted great attention as substrates for protein nanopatterning. Here we report the synthesis of a polymethyl(methacrylate)-polystyrene-based diblock copolymer which, once spin-coated, is capable of self-segregating into cylindrical polystyrene (PS) domains. In this copolymer, the PS block was modified to introduce biotin below 10% molar in order to achieve molecular recognition of streptavidin. The PMMA matrix used to introduce poly(ethylene glycol) enabled us to obtain an antifouling environment that prevents unspecific protein adsorption outside the domains. The use of the biotin-streptavidin pair in this BCP makes it suitable for nanopatterning of other biotinylated proteins of interest for the purposes of cell biology, biosensors, and tissue engineering. Chemical gradient surfaces are described as surfaces with a gradually varying composition along their length. Continuous chemical gradients have recently been proposed as alternative to discrete microarrays for the high throughput screening of the effects of ligand concentration in cells. Here we review some of the most recent examples in which gradients have been used to evaluate the effect of a varying ligand concentration in cell adhesion, morphology, growth and differentiation of cells, including some of our recent findings. They show the importance of the organization of ligands at the nanoscale, which is highlighted by abrupt changes in cell behavior at critical concentration thresholds. Although promising, organic microelectronics lacks standard fabrication methods comparable to photolithography in terms of resolution. Here we propose a novel and easily scalable on-surface biocatalytical procedure for the fabrication of polypyrrole microelectrodes on insulating surfaces. Arrays of polypyrrole microelectrodes were obtained by surface-guided biocatalytical polymerization, achieving up to 5 [small micro]m in resolution and conductivities up to 3 S cm-1. The mild reaction conditions provided by the biocatalytical approach permit the entrapment of bioactive compounds during polymer synthesis. This system is convenient for drug release purposes, as demonstrated by the controlled release of entrapped biotin through electrical stimulation. These results pave the way for the application of polypyrrole microelectrodes produced through biocatalysis in the development of implantable devices for remotely controlled tissue interactions. It is known that cells respond strongly to microtopography. However, cellular mechanisms of response are unclear. Here, we study wild-type fibroblasts responding to 25 Î¼m2 posts and compare their response to that of FAK-/- fibroblasts and fibroblasts with PMA treatment to stimulate protein kinase C (PKC) and the small g-protein Rac. FAK knockout cells modulated adhesion number and size in a similar way to cells on topography; that is, they used more, smaller adhesions, but migration was almost completely stalled demonstrating the importance of FAK signaling in contact guidance and adhesion turnover. Little similarity, however, was observed to PKC stimulated cells and cells on the topography. Interestingly, with PKC stimulation the cell nuclei became highly deformable bringing focus on these surfaces to the study of metastasis. Surfaces that aid the study of cellular migration are important in developing understanding of mechanisms of wound healing and repair in aligned tissues such as ligament and tendon. Cell motility is an important phenomenon in cell biology, developmental biology, and cancer. Here we report methods that we designed to identify and characterize external factors which direct cell motions by breaking locally the symmetry. We used microfabrication and microfluidics techniques to impose and combine mechanical and chemical cues to moving fibroblasts. Gradients can thereby be engineered at the cellular scale and this approach has allowed to disentangle roles of the nucleus and protrusion activity in setting cell directions. The generation of induced pluripotent stem cells (iPSCs), especially the generation of patient-derived pluripotent stem cells (PSCs) suitable for disease modelling in vitro, opens the door for the potential translation of stem-cell related studies into the clinic. Successful replacement, or augmentation, of the function of damaged cells by patient-derived differentiated stem cells would provide a novel cell-based therapy for skeletal muscle-related diseases. Since iPSCs resemble human embryonic stem cells (hESCs) in their ability to generate cells of the three germ layers, patient-specific iPSCs offer definitive solutions for the ethical and histo-incompatibility issues related to hESCs. Indeed human iPSC (hiPSC)-based autologous transplantation is heralded as the future of regenerative medicine. Interestingly, during the last years intense research has been published on disease-specific hiPSCs derivation and differentiation into relevant tissues/organs providing a unique scenario for modelling disease progression, to screen patient-specific drugs and enabling immunosupression-free cell replacement therapies. Here, we revise the most relevant findings in skeletal muscle differentiation using mouse and human PSCs. Finally and in an effort to bring iPSC technology to the daily routine of the laboratory, we provide two different protocols for the generation of patient-derived iPSCs. Cell migration is a crucial event during development and in disease. Mechanical constraints and chemical gradients can contribute to the establishment of cell direction, but their respective roles remain poorly understood. Using a microfabricated topographical ratchet, we show that the nucleus dictates the direction of cell movement through mechanical guidance by its environment. We demonstrate that this direction can be tuned by combining the topographical ratchet with a biochemical gradient of fibronectin adhesion. We report competition and cooperation between the two external cues. We also quantitatively compare the measurements associated with the trajectory of a model that treats cells as fluctuating particles trapped in a periodic asymmetric potential. We show that the cell nucleus contributes to the strength of the trap, whereas cell protrusions guided by the adhesive gradients add a constant tunable bias to the direction of cell motion. Dip-pen nanolithography and microcontact printing were used to fabricate mesopatterned substrates for cell differentiation experiments. A biotin-thiol was patterned on gold substrates and subsequently functionalised with streptavidin and biotinylated bone morphogenetic protein-2 (BMP-2). The feasibility of mesopatterned substrates containing immobilised BMP-2 was proven by obtaining similar differentiation outcomes compared to the growth factor in solution. Therefore, these substrates might be suitable for replacing conventional experiments with BMP-2 in solution. 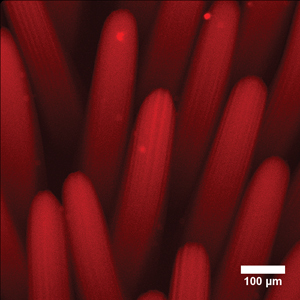 An extended microcontact printing technique to chemically pattern hydrogels is reported. The procedure employs standard polydimethylsiloxane stamps and requires minor pre-processing of the hydrogels by freeze-drying. Micropatterned Matrigel[trade mark sign] and gelatin hydrogels induce NIH-3T3 cell alignment and elongation. Furthermore, human embryonic stem cells cultured on fibronectin-patterned hydrogels display beating foci earlier than those cultured on non-patterned substrates.